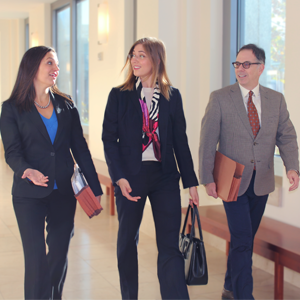 Deputy City Attorneys Megan Cesare-Eastman, Victoria Weatherford and Tom Lakritz walk into Dec. 15 hearing in which the court rejected Kihagi’s bid to derail Herrera’s lawsuit. SAN FRANCISCO (Dec. 15, 2015)—A San Francisco Superior Court judge has rejected a pre-trial bid by landlord Anne Kihagi and her business associates to block City Attorney Dennis Herrera’s lawsuit alleging that Kihagi is waging an illegal “war of harassment, intimidation, and retaliation” against her tenants to force them from their rent-controlled homes. Once vacated, according to Herrera’s complaint, Kihagi routinely orders unpermitted construction work before re-renting the unapproved and potentially dangerous units to new tenants at vastly higher rents. Seniors and disabled tenants are particularly vulnerable to the vicious treatment alleged, with court pleadings and declarations detailing heart-wrenching examples of abuse that Kihagi inflicted on a cancer-afflicted 65-year-old Army veteran, a 71-year-old retiree, and a now-deceased 91-year-old great grandmother. Kihagi’s pre-trial moves aimed at derailing Herrera’s suit included two demurrers involving Kihagi and business associates. Neither pleading challenged a single fact Herrera alleged, contending instead that such ruthless and defiant business conduct is entirely lawful. Another of Kihagi’s attempted procedural roadblocks sought to strike portions of Herrera’s complaint involving widespread code violations at nearly all of Kihagi’s San Francisco properties. Kihagi’s legal team advanced an unfounded interpretation of California law, arguing that such allegations were improper because the violations were already corrected. In fact, the violations were nearly always abated long after the deadlines imposed by the Department of Building Inspection. Ruling from the bench at this morning’s hearing, Judge Harold E. Kahn was overruled both demurrers in their entirety, and similarly denied in its entirety Kihagi’s motion to strike. The next major milestone in the Kihagi case is a hearing on Herrera’s motion for preliminary injunction, which is currently scheduled for Jan. 12, 2016 before Superior Court Judge Richard B. Ulmer Jr. Herrera’s office is seeking a court order to enjoin Kihagi from continuing to engage in illegal business practices while the case is pending. If successful, Herrera’s motion would halt Kihagi’s illegal evictions and harassment practices, and restrict her personal contact with tenants by requiring her to hire a third-party professional to manage the properties. The injunction would also require Kihagi and her web of associated business entities to fix housing and safety code violations; obtain all requisite permits; and submit to city inspections to ensure the safety and health of residents and neighbors. In California, violating such injunctions can result in significant civil penalties and incarceration in county jail. Properties at issue in the litigation so far include: 3947 18th Street, 195 Eureka Street, and 1139 Guerrero Street, all in or near the Castro neighborhood; 69-75 Hill Street, in the Mission; 1000–1022 Filbert Street, in Russian Hill; and 650 Church Street, near Dolores Park. The case is: City and County of San Francisco and People of the State of California v. Anne Kihagi et al., San Francisco Superior Court No. 15-546152, filed June 4, 2015.